When you join FNB, you'll spend your first three weeks in the Welcome department. Because we understand that starting your first job can be daunting - there is just so much to find out about the organisation, the people you're going to be working with and the work environment, let alone getting to grips with your new job and hitting the ground running. Our three week induction programme is designed to quickly get you up to speed - you'll learn the ins and outs, the day-to-day running of the organisation and discover the tools that will help make your job and your life easier - like the FNB Intranet, understanding your payslip and benefits like medical aid, provident fund and wellness as well as discover our exciting onsite services. You'll also get to network with other graduates, your managers, HR and all the CEOs. After your three week induction programme, you'll get to enjoy an inspiring and exciting weekend finale at an amazing venue. Together with the rest of the Grad team, you'll get to reflect about the journey so far, the networks you've made and the relationships you're building. It's guaranteed to be a weekend of memories that will stay with you long after you've become part of the Elite Grad Alumni. Alongside getting stuck into work and putting all you've learnt as a student into action, you'll be part of an innovative six months training programme. Because work is more than just applying your academic brilliance. You'll learn valuable skills that will help you build on your day-to-day job as well as set you up for the future. Some of the modules covered are Project Management, Interpersonal Skills, Presentation Skills, Business Writing and more. All the training is done in groups so you'll also get to reconnect with other graduates and have each other's support. One of the first big exciting projects you'll do at FNB is the Service Channels Project where you'll get to prove how innovative you are. You'll receive the project during the induction programme and will have 3 weeks to complete it. It's meant to stretch you, be fun and exciting, but at the same time it's your opportunity to make a serious business impact and see your ideas in action every day. Past graduates came up with innovative solutions that changed the way we think about doing our banking, saving our customers time and money and improving their banking experience in general. You'll be split into teams with other graduates and get to engage with managers and employees at various FNB branches, as well as meet the energetic teams at our contact centres and visit ATMs. And then it's up to you and your teams. You'll get another opportunity to demonstrate your innovative ability that could see you competing in the big league. The Graduate Project kicks off in March and is done in groups,with each group sourcing a project that needs to come to life before November of your Grad year. You'll get to present to senior stakeholders and FNB customers. The Top 3 innovations are awarded prizes, which range from trips to Cape Town and Sun City and other exciting prizes. 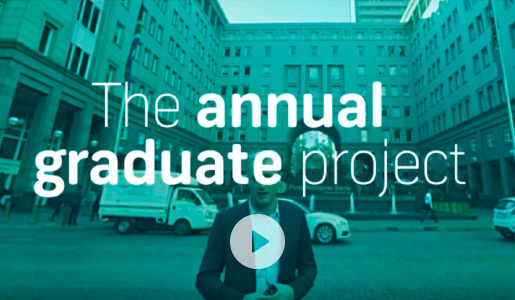 What's even more exciting is if your project is truly impressive, you can log it on FNB's Innovation Programme, where you get to compete with the best of the best across the entire FNB group and not just other graduates. Innovation is highly valued at FNB. So your idea could not only help keep us ahead of the other financial institutions, it could put you in the running to win over R1 million. Just like the South African Future League Programme, all our international graduates get to take part in the same training, team building and projects. You will be seconded to South Africa for the duration of the programme and will return to your home country in January of the following year. If your studies are in faculties such as Science - IT, Statistics or Actuarial Studies - and Engineering and you're getting close to completing your degree, we'd love to host you and help you find the work that will be most meaningful to you. We take in students during the June and December holiday periods and applications open during the preceding months. Most opportunities are based at our head office in Johannesburg, but we also host students at various offices across the country, depending on the assignments available. Spaces are limited so make sure to get your application in on time. We select students who are going places, based on assessments and academic performance. You'll then be put into groups based on your field of study, such as quantitative, IT, engineering and commerce. That's where it starts to get really interesting and exciting. Your group will jump straight in by spending time with business units applicable to your skillset. So you won't find any actuaries wondering around group facilities or scrum masters in finance. You'll be exposed to real work situations and get a sense of what you could be doing at FNB and what career opportunities lie ahead. In the evenings you'll get to meet past graduates, managers and some of our executive team who will give you a broader sense of working at FNB, what the culture is like and what drives us to be one of the most innovative banks in the world. At the end of it all, we want to see if we'd be a great fit for each other. So your business unit will assess your suitability to their area and you'll be given an unusual group test to see if you've got what it takes. The test will show us what you're made of and how much of a team player you are, while you have fun. The next step could be an extraordinary career at FNB. Make sure you get your application in before they close. You need to be in your final or penultimate year of studies and submit your application between 1 March and 30 June in order to be selected for the sessions that take place annually in June and July. We believe in growing future leaders for South Africa, which begins with growing our brightest young minds. The reality is that there are many strong academic students who show the greatest potential and dedication, but have very limited financial resources. Which is why we've established the FNB Bursary Programme for top-class students who need funding to complete their commerce and science degrees. We believe in investing in you, without any expectation of you working back or paying back the funds. It's another way in which we're committed to helping to create a better world. Because a better world needs better leaders. We've partnered with only the best bursary service providers to ensure we're helping deserving students receive the education, mentorship and support they need. So speak to one of our bursary service providerstoday. What degrees did you complete and at which university? When did you join FNB? What is your role at FNB? My job is to gather and analyse business requirements and complete process mapping. I assist with solution design and consulting and, most importantly, I have to ensure that the final solution meets the business need. Some of the highlights of my job include networking and working with awesome people and having the opportunity to make a difference in the organisation. Another one is being able to relate IT in the banking industry. A challenge has been to work with a wide variety of stakeholders that can sometimes be quite difficult customers. What does a typical hectic day look like in your job? Most of my day is taken up by meetings, and I also have to make time to catch up with the development team. The rest of the day is dedicated to something simply called 'making things happen'. What can you tell us about working at FNB? Innovation is in the DNA of the FNB culture and it has continuously required me to challenge and reinvent myself. FNB has provided a platform of support, sharpened my technical analysis skills and allowed me to nurture and develop my people skills. These, I believe are all essential at the beginning of one's career. What does your job entail at FNB? I make use of actuarial concepts to analyse the total book of Savings and Investments. This involves post and predictive analysis on customer and balance behaviour. Insights gained from this interesting analysis are used to inform strategic decisions for Savings and Investments as well as the bank. What has been a highlight and challenge within your time with FNB? A highlight has been the growth in my knowledge base, skills and realising non-traditional use of actuarial knowledge. A challenge has been the move from a theoretical to a fast-paced, practical environment and needing to learn new skills such as coding. I am a Process Engineer for FNB Premium Core Technology Solutions. What does a Process Engineer do? A Process Engineer analyses and documents processes with the aim of introducing process visibility and process improvement. I document processes and mainly work as a System Architect for a Data Centre Infrastructure Management (DCIM) system. The highlight was being part of a Data Centre Reengineering project, and assisting with energy audits for some of the FirstRand buildings. The challenge but great part about the role is that there is a steep learning curve. For most parts of 2015, it was juggling between energy audits, process documentation, supervising construction, and optimising our DCIM system. Working in a critical environment also means there's a load of responsibility, which means a lot of growth on my part. What does a Business Relationship Analyst do? Being a Relationship Analyst is all about analysing credit data to estimate degree of risk in extending credit or lending money in support of a broader client relationship. It's also about managing the growth of active customer account base. More than anything, the job title entails converting identified leads into successful sales. Above all else, the highlight of my job is the client interaction. When I first started, I was very nervous and afraid to communicate with clients because I knew nothing at all about banking and thought clients would be intimidating, but the clients were amazing! Yes, university equipped me with the theoretical side of engaging with clients, their financials and all the different enterprises but the practical is so exciting! If you are a person who places much value on comfort, then this job is definitely not for you as it completely throws you out of your comfort zone. Each day comes with its own challenges, disappointments and victories and that is the fun part. Yes, you never think you are ready, just like you weren't ready for high school and driving a car for the first time but after completing the task, that's when you realise just how ready you were. At FNB, we're always looking for graduates who are ready for the big world. And ready to make a difference. Through the work you'll do and the attitude you bring, you can shape the organisation, the industry and the world. Because we're driven to not only help customers but are also determined to create a better world. Our FNB Future League Programme is designed to immerse you in the world of FNB from day one, providing you with essential training and skills. All our international graduates get to take part in the same training, team building and projects. We're looking for the curious and the courageous, team players who are obsessed with mastery but are also emotionally intelligent. 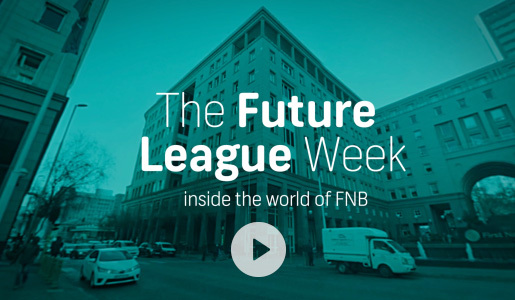 Future League Week is designed to give you a sneak peek into a career extraordinary at FNB and give you a taste of what the Future League Graduate Programme is all about. If you're curious about what it's like to work at FNB as well as find out about potential career paths for your academic background, vacation work is a great opportunity. Not only will you get real work experience that makes use of your specific knowledge and skill sets, you'll also get experience across different business units to see what career path will best suit you. Real work experience means you'll also get to add real value to what we do at FNB..
We believe in growing future leaders for South Africa -growing our brightest young minds.